One of my favorite places to go when in need of soul refreshment is the MDK Lounge. Specifically, the MDK Team Blanket threads; they overflow with the best of humanity and knitting. One of these ambitious blanket teams is Team Blanket No. 2—the Fighting 2— headed up by Team Blanket Leader Karen Tumelty. 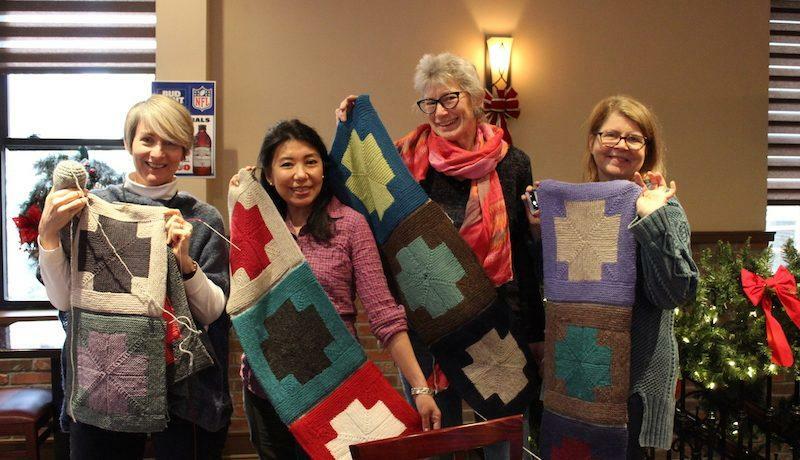 I have lost track of how many squares have been knitted by this intrepid team, but I think Karen has collected enough squares for at least seven blankets, all for victims of a devastating apartment building fire in Yonkers, New York, earlier this year. 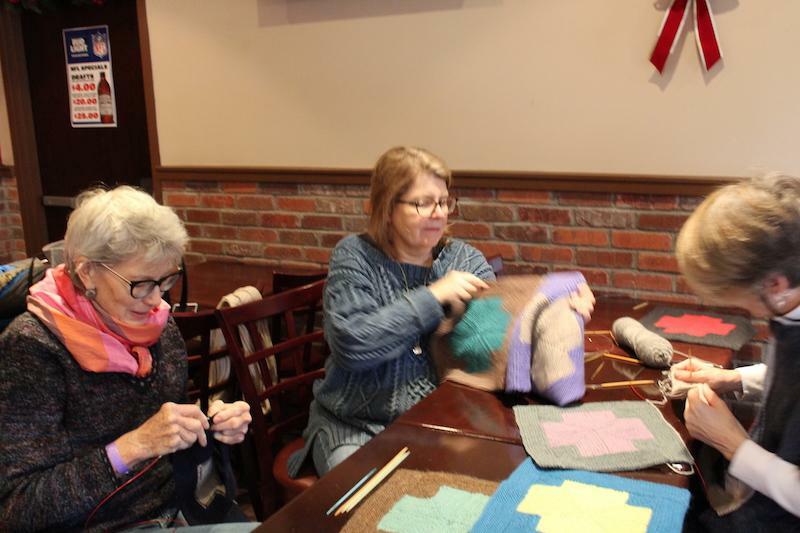 A couple of weeks ago, Karen convened the first of what she hopes will be several sew-up parties. I loaded up my long circular needles, pointed the Mom Bomb northward, and headed for a friendly, well-lit pub on Main Street in Yonkers. First up for sew-up, laid out real pretty. these are some bouncing and behaving squares. Karen was ready. Karen was organized. She had T pins and index cards. These blankets are not going to be some higgledy-piggledy montages of squares (not that we don’t love a folkloric team blanket, because we definitely DO). 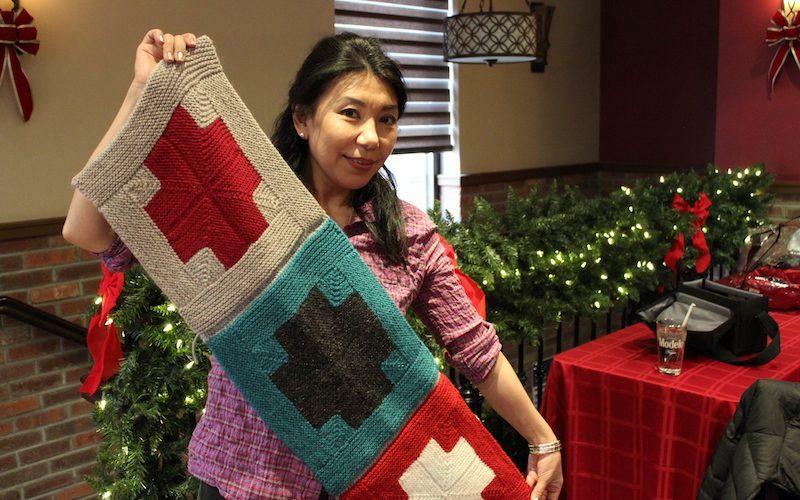 Karen sorted her bounty of squares into cohesive colorways. 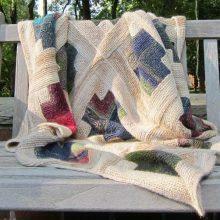 She even had enough squares in variegated yarn to make a Variegated All-Stars Team Blanket No. 2. We were the few, the proud, the first sewer-uppers. From left: Kristen, Kesang, Pat, and me. karen is behind the camera, orchestrating. Kristen, on the precipice of her first 3NBO seam. When a three-needle bindoff is happening, a bit of kaysplaining is inevitable. just let me get it out of my system. Kesang is our Team Blanket Spokesmodel. Why am I telling you all this, Ann? Because I know you share my love of the instant bond of group blanket seamers. I had flashbacks to sewing up our long-ago blankets for Afghanistan. Thank you, Karen! See you at the next one! P.S. 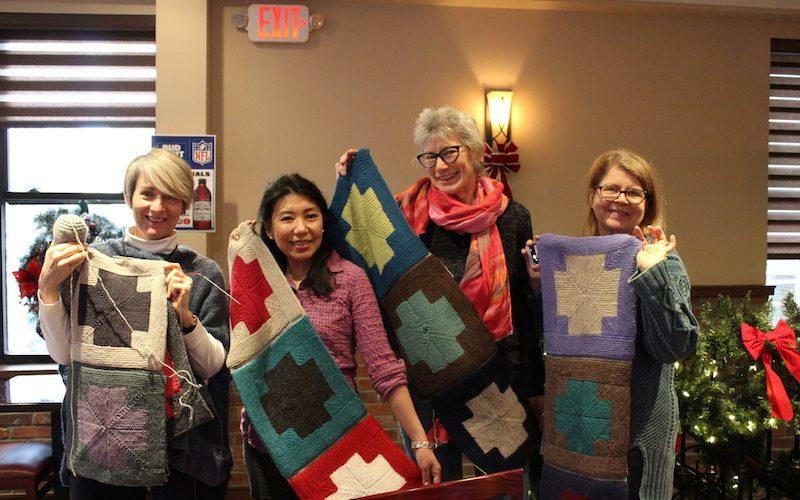 I don’t want to miss a local-to-me sewing-up party if I can help it, so please give me a shout if any of you Team Blanket Leaders are scheduling sew-ups in the tri-state area. 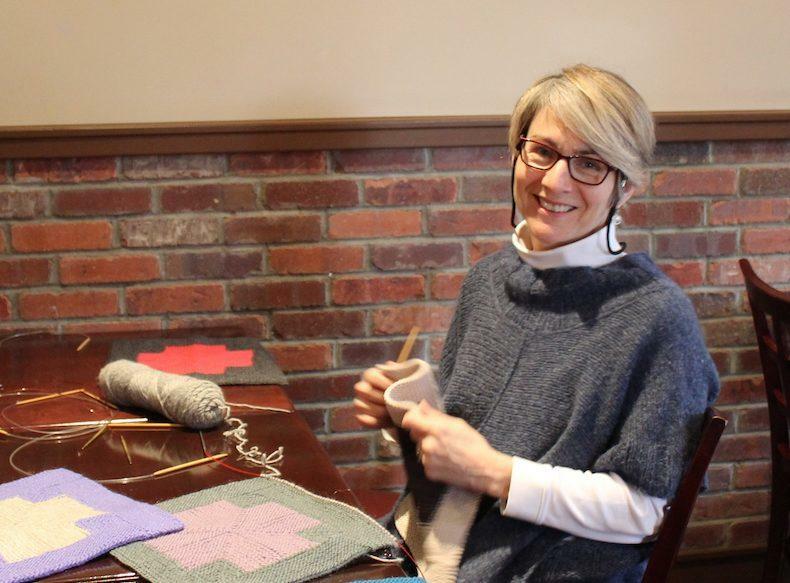 Feel-good knitting that comes with new knitting friends. I am assuming there was no planning when it came to colors, which makes it doubly exciting that all together, your crosses look so dang beautiful. And I love that because I am traveling and five hours ahead, I get to be one of the first comments. Wow! All the squares looks so beautiful! 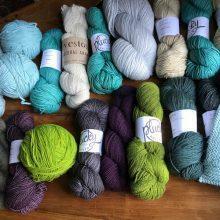 Wow, can you share the sweater pattern names for Kristens’ sweater as well as Kays’? They are pretty amazing! The blanket is really beautiful, thanks for sharing this with us! I hope we hear from Kristen! This is exactly what I was going to ask! Thank you for sharing the link to Whitby, and I hope we do hear from Kristen. It’s the Two Harbors Poncho by Sarah Smuland. In Tahki Yarns Tahoe, which is incredibly soft and light. Thank you Kristen! I was just about to ask the same thing. Thank you. I like it so much better on you than in the pattern photos. Off to look at other ones. I have a lot of appropriate yarn for that. I know, right? A poncho that doesn’t look like a poncho. I use a three-needle bindoff as a design element on the right side. If you bindoff in k1p1 the seam faces up instead of to one side. I’ve even done this with crocheted squares for a quilted effect. This is right up there with the Patty Lyons One-Maneuver SSK as a GAME CHANGER! Oh wow, that’s my kind of party. I wish I could have been there! The blankety goodness is really wonderful to see. PS I see my squares! Hi squares! This is wonderful – it looks like so much fun! 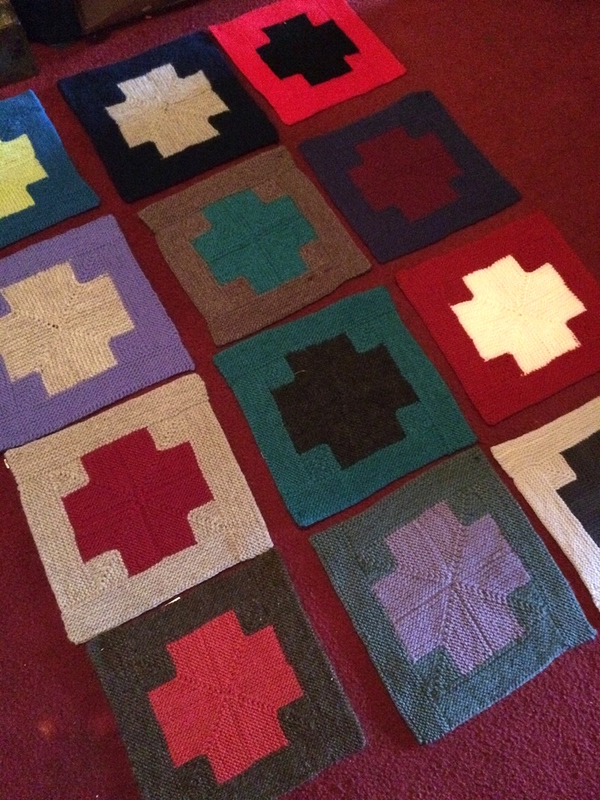 And the squares are really beautiful. This makes me so happy on this Thursday morning when I’m feeling melancholy…thanks for the day brightener!! 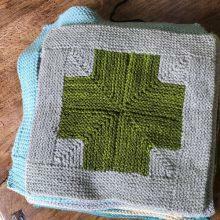 I love seeing you all sewing those squares up!! What a great way to accomplish the tedious finishing task. Beautiful knitting, everyone! Did I miss the post about Tia receiving her blanket? It’s Whitney— I put the link above. It’s a fun cable pattern, attainable by anyone who can read a cable chart. Good work, all! 🙂 Brings tears to the eyes…………..
Wow. I had no idea what an amazing adventure this would be! I’ve been trying to post all day but every time I started typing I got all happy and weepy and it was all too much for me! In the best possible way. Goodness gracious! This is so much more than an online community–it’s a neighborhood. For the record, I cannot take much credit for putting the colors together. I just put them all out on the floor in sets of 12 and let them tell me which ones wanted to move. 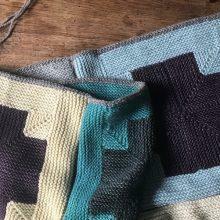 There are two in the first layout picture that decided they wanted to join another blanket. They are so much happier there. I think that having a specific yarn to use (along with a few rebels) made it a lot easier. The Brown Sheep palette was already curated at their factory. We just narrowed it down a bit. 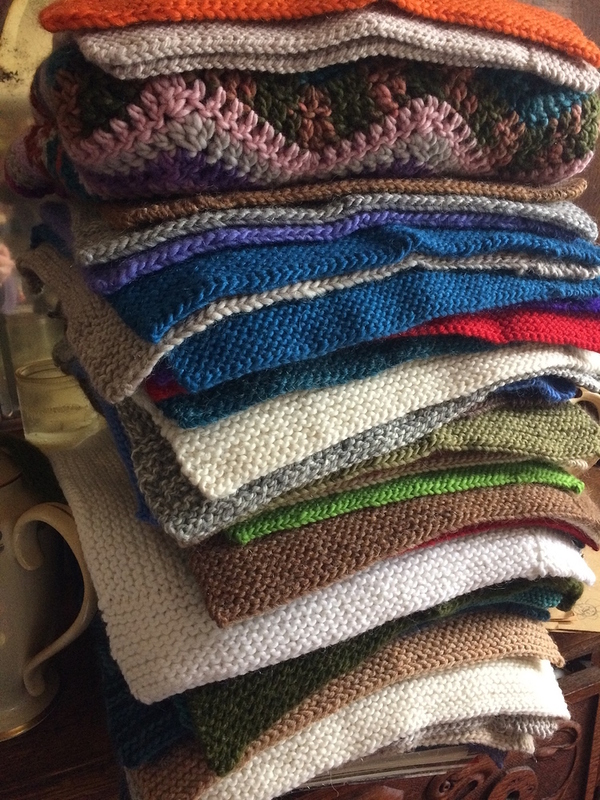 We are in good shape for eight blankets plus that ridiculously beautiful crocheted blanket that Ann Webb sent along. Which means there will be a blanket for the firehouse. Our Lady of the Three Needle Bind Off, gave us a rock solid, mid-western tutorial on the technique (here it is, here’s how you do it, now go! Bind off!) No dancing around, no hand holding, just trust! It was wonderful. There will be more gatherings after the holidays. And no, you don’t have to be a member of Team 2 to come along for the ride. All are welcome! I’ll post some dates soon. There is so much more to say but I’m tearing up a little (again!) so I will leave it with this. Loving Action is a wonderful thing. You are all spectacular. Ann, that is not one of your squares! But I love that you see your own work in someone else’s square. Connections have been made. We have found common ground. There is so much divisiveness in our world right now and seeing ourselves in each other is making me cry yet again. 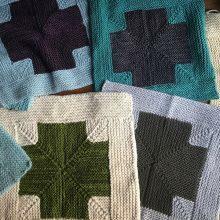 The only intentional move that I made when I first threw all the squares down on the floor was to make sure that your squares, Kay’s squares, and my squares were spread out among the piles. I’m hoping we’ll be able to find a date when you’re in town to sew up one with your square in it while you’re here. Turns out Kristen knows one of my oldest and closest friends. Go figure. 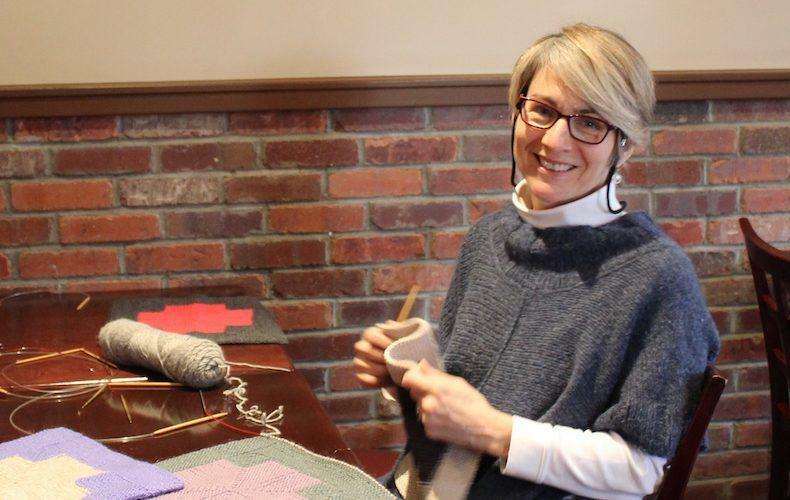 Pat Slaven (aka The Stain Maven–she can get anything out of anything) is a lifelong fiber engineer (among other types of engineer) and fiber artist. Even she learned something new! She also grows the best tomatoes. Kesang had a crappy morning. I met her briefly a few weeks earlier and texted her at the last minute. Turns out, it was at the exact moment when she was saying to herself “I gotta get out of this house today!” Kismet!! Kay’s sweater was fantastic. Dare I say epic! Kristen’s sweater (with apologies to Kay) was even more epic because she’s a newbie. I touched it (pet it is more like it). It’s delish. I was blown away by how quickly the work got done. Remember that scene in the beginning of The Godfather when Marlon Brando says “You come to me on the day of my daughters wedding, blah, blah, blah, a day may come when I ask you for a favor, blah, blah, blah” but it’s really clear that Don Corleone has that guy’s marker? Well I’m that guy and Kay’s Don Corleone. Not only did she teach us all, she worked her tail off and then took the whole shebang home, finished up the long seams and did the icord. I will go to the mattresses for her anytime. You are all wonderful people and I love you so! Oh, you’re making me cry, too. How do non-members get in on this? I’ve come back to knitting (after 45years), and now that the sore spot (rubbed by the needle? ), has healed, my fingers are itching to do something. Over in the Lounge we have several “team blanket” threads, some of which I believe are still collecting squares. 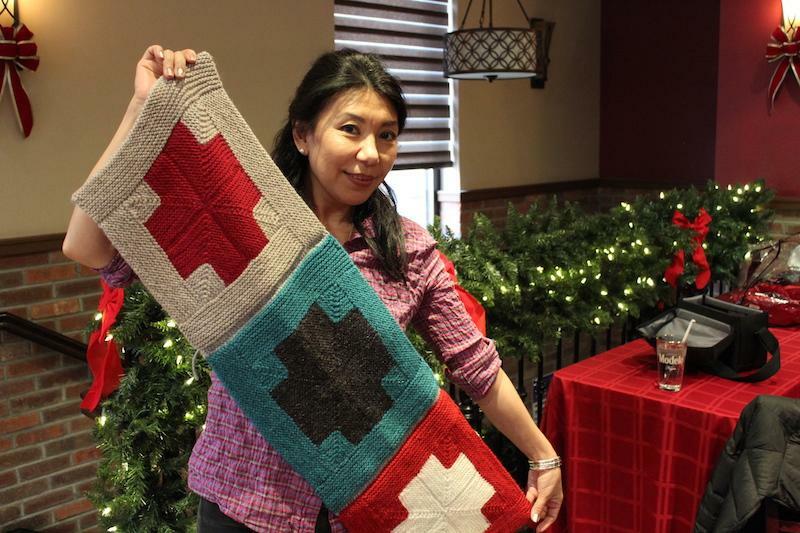 You can also lead a new team blanket for someone who could use a blanket. 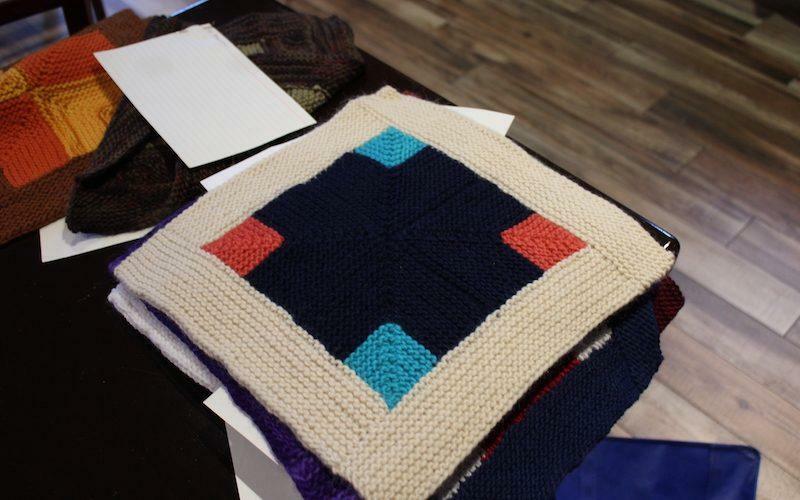 Stay tuned to Team Blanket #2 if you’re based in New York, as Karen will convene more sewing-up sessions after New Year’s, and all are welcome to come help turn squares into finished blankets. I’ve got one of those sore fingertips right now. Blaming it on the i-cord trim on the team blanket! P.S. 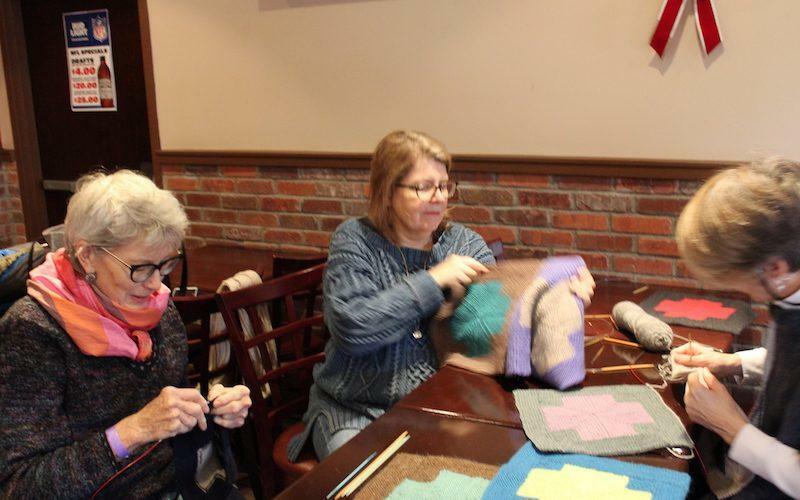 The staff at Francey Brady’s were charmed to have the knitters in the house. They were a little confused at first but then turned the lights up and took good care of us. I love everything about this post right down to the well-lit pub for knitting. That’s a whole basket full of good eggs right there. I may see my square! Bottom right of the group square shot? This is like looking for your kid at commencement! Flashbacks to the daily search for my kids on the summer camp website! They’d be in the background of a shot of pingpong, or ropes, or whatever crazy thing they were up to. And always: FILTHY. Aw, what a great party! 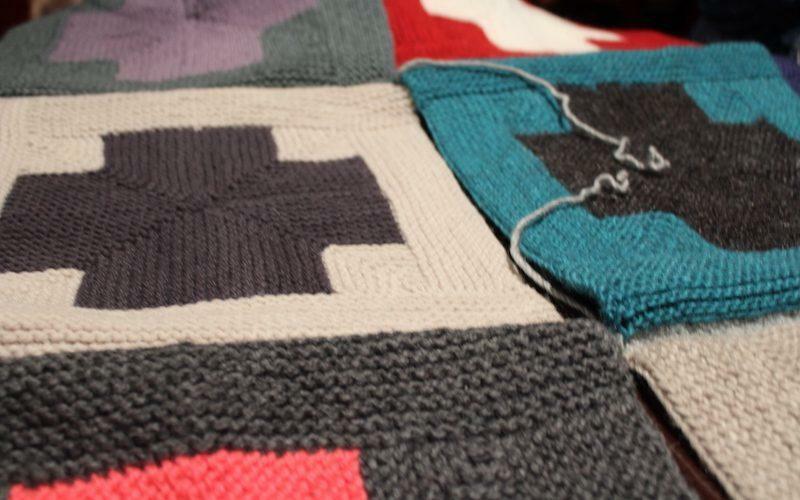 Beautiful squares, beautiful blankets, beautiful knitters! Or at least until summer. Is there a post somewhere about how to organize a good sewing up party? If not, I would like to read one! Great idea! It’s not exactly difficult, but there are lots of little details. Karen did a brilliant job of organizing everything so that we could get to work immediately and have a great time.